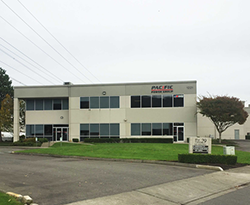 Pacific Power Group, a leading provider of MTU Onsite Energy generators and generator service on all brands, announces today that its Power Generation Division has moved to a new, expanded facility in Auburn, Wash. The expansion to the larger location positions the Power Generation team to grow over the next several years and expand on recent successes in both MTU Onsite Energy generator sales and preventative maintenance service. The new location centralizes the entire Power Generation product sales, service and parts teams together in one location to offer customers optimized customer service capabilities. The new 16,000 sq. ft. facility accommodates a significantly larger inventory, allowing the Power Generation team to fill customer parts and inventory needs faster and more efficiently than before. “This is an excellent opportunity for our Power Generation Team. We are excited about the opportunities that our new space creates for our teams as we continue to provide superior support for our clients across the Western U.S.,” said PPG Director of Power Generation Travis Coffey. Moving to this larger space, both Power Generation products sales and service teams will be better positioned to meet the power generation needs of PPG’s clients.